Below are 3 articles on the shocking torturing to death of Arafat Jaradat, a Palestinian civilian, by the secret police (Shin Bet) of the Middle East’s only democracy. We can be sure that when Israel tortures Palestinians, it does so democratically. No doubt it will hold an inquiry with the torturers judging the torturer and finding ‘mistake’s were made. No doubt the angle with which Arafat was hung was not right. The doctors didn’t pick up the signs of complications in time and of course the prisoner was to blame for not talking quickly and confessing. We will go through this kind of mockery with the BBC giving Mark Regev time enough to justify the unjustifiable. But let us be quite clear. Torture in Israel is as much official policy as it is in Iraq and Saudi Arabia. But whereas the latter don't claim to be western democracies Israel likes to pretend it is 'cool' and 'friendly' and 'green' and 'moral' etc. It says it should be judged by different standards and then complains when it is. Left Zionists will bemoan the ‘damage’ that the occupation is doing to those nice Israeli boys. The Arabs are to blame for making them into animals. But let us not forget that torture was rife under Israeli Labour governments and indeed, as Israel Shahak pointed out, it lessened under Prime Minister Menachem Begin who, because of his involvement in Irgun had some moral objections that 'left' Zionists never had. And we should not forget, despite the undoubted hypocrisy of the Palestinian Authority, that the use of torture and deaths through torture are rife there too. As sub-contractors for Israel and the United States, the Abbas junta can match anything Israel does but we should not forget that the source of the iniquity lies in the Israeli state. In particular it was the Israeli High Court which on September 6 1999 upheld the Landau Report of 1987 and approved the use of 'moderate physical pressure' i.e. torture. The 9 man Supreme Court was headed by the 'liberal' Aharon Barak. 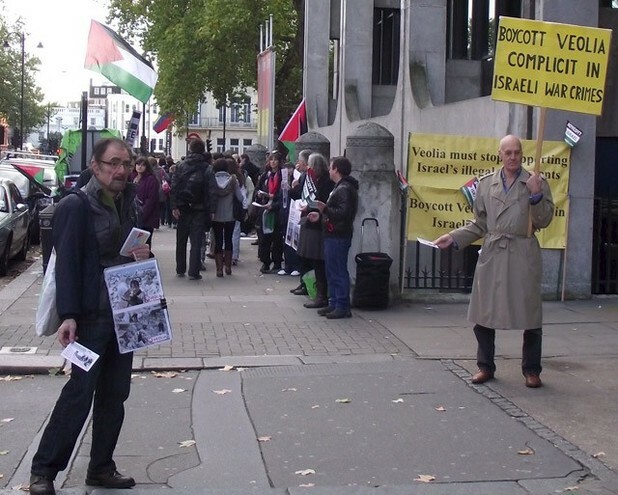 I print an open letter from the indefatiguable campaigner, Dr Derek Summerfield, who has campaigned long and hard against the complicity of the Israeli Medical Association in the supervision of torture by Israeli doctors. Dr Summerfield Israel Medical Association Defends Torture Doctors and Cuts Ties with Israel's Physicians for Human Rights He has castigated the World Medical Association which has given the IMA carte blanche and even appointed the head of the IMA, Dr Yoram Blacher, as its President. The same mentality that infused the SS doctors and Mengele is on display again. Just as in Guantanamo and other centres of US and state torture, doctors turn the Hyppocratic Oath into the Hypocrites Oath. Below is a Press Release from the Palestine Committtee for Human Rights and an article from the veteran Israeli civil rights activist and journalist, Amira Hass, writing in the Israeli newspaper Ha'aretz. But of one thing we should be clear. A democracy doesn’t torture its residents. Israel as an occupier of Palestinian land and a ruler over those who have no say in the Occupation, cannot by definition be democratic. And as Prisoner X, a Jewish prisoner who ‘committed suicide’ when imprisoned without trial or indeed any publicity, 3 years ago shows, the erosion of democratic rights may begin with the Palestinians but ends up with Israeli Jews too. Whereas the British and French empires could separate, by distance, their undemocratic barbaric practices in the colonies from the motherland, for Israel this is not possible because the Occupation of the Territories is adjacent too indeed a part of Israel itself. That is another reason why only a single unitary and secular democratic state is the solution. Palestinian officials are demanding an enquiry into the death of a Palestinian prisoner, Arafat Jaradat, aged 30, who collapsed while being interrogated last weekend, 5 days after being arrested for suspected stone throwing last year. Israeli officials were reported in several London newspapers as saying that he died of a "sudden heart attack" while being interrogated, saying also that 2 days earlier he had been examined by doctors (this means Israeli doctors serving in interrogation units) and found to be in good health. The Palestinian Authority Ministry of Detainee Affairs allege that Israeli interrogators used hanging techniques and sleep deprivation to torture Jaradat in al-Jalameh prison, a day before he died in Megiddo prison. They cite a witness who said: "When I sat next to him he told me that he had serious pains in his back and other parts of his body because he was being beaten up and hanged for many long hours while he was being investigated". There are reported bruising and fractures to his trunk consistent with torture- though Israeli authorities are saying these are the result of attempts to resuscitate him. A 30 year old man in good health is detained and 5 days later is dead. In a young man how likely is this to result from a heart attack unconnected to his treatment, as Israeli authorities allege! So by Israel’s own admission Jaradat was seen by Israeli doctors 2 days earlier and they found him in good health. The key medical ethical question is what were these doctors examining him for, if not to assess whether he could withstand torture. This is precisely what the campaign regarding medical collusion with torture in Israel was launched for in 2009, and continues to run. I am reminded that in 1993 a ‘fitness for interrogation’ form came to light, to be signed by a doctor after examining a prisoner, recording medical suitability for torture. The examination of Jaradat is unlikely to have been for any other reason, and this is established practice even if a ‘fitness for interrogation’ form is no longer used. 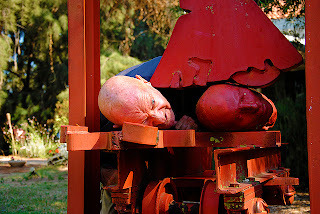 (At the time the Israeli Medical Association feigned surprise that such a form existed; they stated publicly that such a form should not be used (they could hardly do otherwise once it had reached the media) but did not state that Israeli doctors should speak out and refuse to co-operate with interrogation practices deploying torture. This was entirely in line with the IMA’s longstanding and multiply documented defence of current practice and thus of torture as state policy). 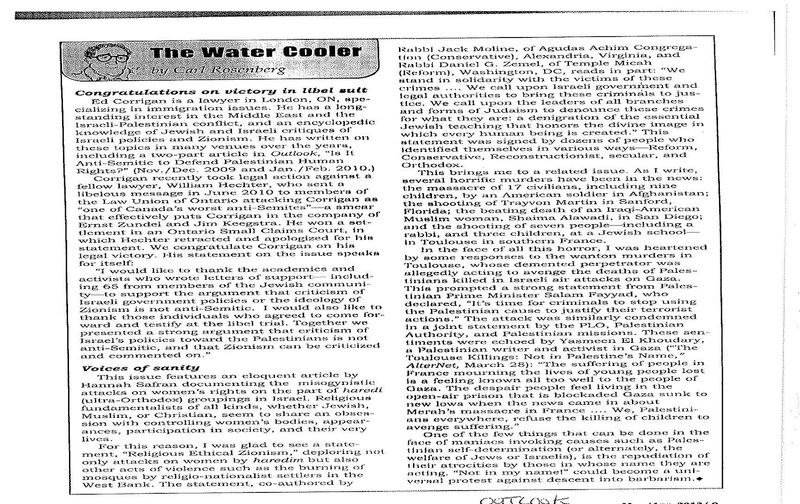 Also in the early 1990s an Amnesty International paper on torture in Israel, documenting what Amnesty called the entirely institutionalised collusion of Israeli doctors, was entitled with intended irony "Under Constant Medical Supervision". This was a reference to what Israeli authorities had stated in supposed defence of Israeli prison conditions and prisoner rights following public allegations about ill-treatment and torture of Palestinian detainees! As Amnesty noted, this was an unintended admission of the role of doctors in the whole process! You will recall the 2007 report "Ticking Bombs" from the Public Committee Against Torture in Israel, using detailed testimony from 7 Palestinian ex-prisoners. It was clear that on a routine basis Israeli doctors would see detainees before, during or after interrogation with torture, did not take a medical history (they knew of course how the injuries had been inflicted, which in one case was spinal damage), returned the detainees to the interrogators, and did not speak out. These doctors were an intrinsic part of a process whose everyday output was torture, as they are to this day and doubtless now in the Jaradat case, and their presence gives license and legitimacy to the torturers. They, and even more culpably the IMA, are failing the test set by the World Medical Association’s Declaration of Tokyo, which mandates doctors not just to have nothing to do with torture, but to protest and speak out when encountered. One scandal our campaign has uncovered is how the WMA has been neutered when it comes to Israel- though it will take action when alleged offenders are in Bahrein or Iran or Nigeria. The autopsy report prepared by Dr Saber al-'Aloul, Director of the Palestinian Medico-legal Institute on Arafat Jaradat, a Palestinian detainee who died in an Israeli prison, has concluded that Jaradat's death was caused by nervous shock resulting from severe pain, which was caused by multiple injuries inflicted through direct and extreme torture. Arafat Shalish Shaheen Jaradat, 30, from Sa'ir village northeast of Hebron in the southern West Bank, died in Megiddo Prison inside Israel on Saturday, 23 February 2013. Israeli authorities claimed that he died due to an apparent heart attack, but the Palestinian Authority and numerous human rights organisations raised doubts concerning the Israeli narrative, and are calling for an independent investigation into Jaradat's death. An autopsy of Jaradat's body was performed in the Israeli National Institute of Forensic Medicine in Abu Kabir in the presence of Dr Saber al-'Aloul and two Israeli physicians on the day after his death. Contrary to Israeli claims that Jaradat died due to an apparent heart attack, the autopsy showed, according to the Palestinian physician's report, that "the heart muscle is perfectly healthy; no signs of harm or signs of a recent or previous myocardial infarction [...]" The report indicated that there were multiple injuries on Jaradat's body. For example, the report stated: There are recent excoriations and bruising on the inside of the lower lip; there is severe bruising on the upper right back; there are circle-shaped bruises on the bottom of the front right side of the chest; there is bruising on the facis lateralis brachii of the left elbow; there is bruising on the back of the right arm; there are deep bruises, 4x9 centimetre in diameter, on the muscle of the upper left shoulder, adjacent to the spine, below the neck; the bruises damaged the tissue of the muscle; there are 4x10 centimetre bruises on the right side of the chest; the bruises penetrated the skin and caused damage to the muscle tissue; they were located 27 centimetres from the spine, 53 centimetres below the top of the head; there is a fracture in the second and third ribs on the front left side with bruises around the fracture; and there is a fracture in the second rib on the front right side of the chest. The report emphasised that all fractures or wounds were recent, that the injuries were severe, and had resulted from direct and extreme torture. The Palestinian Centre for Human Rights (PCHR) stresses that torture is an international crime that amounts to a crime against humanity and it constitutes a blatant violation of human rights, which can never be justified under any circumstance. It is prohibited under several international instruments, including the Convention against Torture of 1984, which was ratified by Israel in 1991, and the Rome Statute of the International Criminal Court. According to PCHR's documentation, this case is part of a phenomenon in which thousands of Palestinian detainees in Israeli prisons and detention facilities are subjected to torture by Israeli security services. Calls on the United Nations, the International Committee of the Red Cross and the international community to put pressure on Israel to put an end to the use of torture and to open prisons and detention facilities for monitoring. For years, Palestinian detainees and prisoners have complained about sleep deprivation, painful and prolonged handcuffing, humiliation, beatings and medical neglect. By international standards, this is torture. 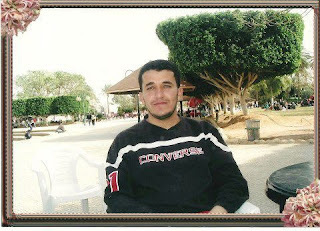 Arafat Jaradat, 30, died while under interrogation by the Shin Bet security service. 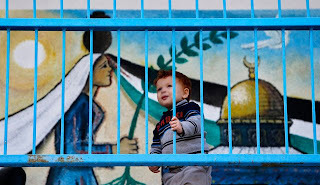 Every week dozens if not hundreds of Palestinians start down the road he began on February 18. Dozens of Israelis whose names are unknown are on a parallel track: the soldiers who make the arrest in the dead of night, the military doctor who examines the new detainee, Shin Bet interrogators in their changing shifts; Israel Prison Service guards, workers at the prison clinic, and the judge who extends the remand. True, thousands of others take this road or sometimes a longer and harder one – and stay alive. This is probably what the Shin Bet and the prison service will say in their defense. But from the Palestinian perspective, every stop on the road of detention and interrogation involves enormous physical and psychological pain that the army, the police, the Shin Bet and the prison service inflict intentionally. This goes well beyond the suffering that should be caused by taking away a person’s liberty and issuing an indictment. For years, Palestinian detainees and prisoners have complained about sleep deprivation, painful and prolonged handcuffing, humiliation, beatings and medical neglect. By international standards, this is torture. Jaradat was not a ticking bomb. He was arrested on suspicion of throwing stones and an incendiary device at Israeli targets. After three days of interrogation the police asked the court (in the name of the Shin Bet) to extend his remand for another 15 days for questioning. 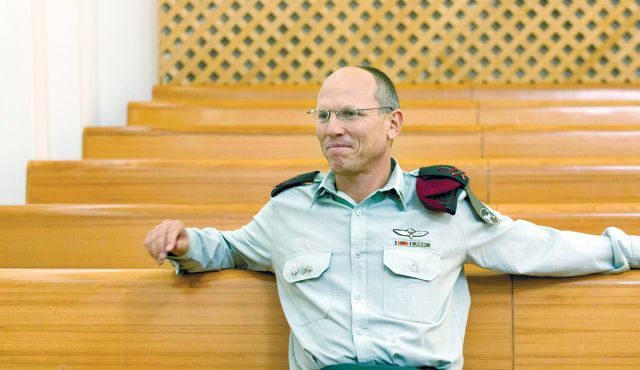 The remand hearing took place on Thursday, February 21, at the Shin Bet’s Kishon interrogation facility, in front of a military judge, Maj. David Kadosh. The judge ordered the remand for 12 days. Kamil Sabbagh, an attorney for the Palestinian Authority’s Prisoner Affairs Ministry, asked the police investigator at the hearing whether there were other suspicions against his client; he was told there were not. He asked whether Jaradat had confessed, and the police investigator answered: "partially." Sabbagh concluded that Jaradat had confessed to throwing stones. Experience shows that the additional days of interrogation – many, considering the minor nature of the offenses – were not intended merely to extract more confessions, but to get Jaradat to implicate others or to gather personal information, even of an embarrassing nature, to use in the future. From reports by detainees to their attorneys, it's clear that sleep deprivation combined with painful and prolonged handcuffing is very common. As we learn at military court and elsewhere, people confess to things they haven't done or implicate others falsely, only to be allowed to sleep. In the short time Jaradat and his attorney had before the remand hearing, Jaradat, who was suffering from a herniated disc, was able to tell Sabbagh that he was in pain from prolonged sitting. Judge Kadosh knew about the pain from a secret report he had been shown.While the judge was writing his decision, Jaradat told Sabbagh that conditions were difficult for him in isolation and he wanted to be moved to another cell. Sabbagh had the impression that Jaradat was under severe psychological stress, and told the judge this. The judge then added to his decision: "The defense attorney requests the court’s permission to present the matter of the suspect’s mental health while in a cell alone, and his concerns about psychological damage. He requests that the suspect be examined and properly attended to." The remand hearing took place at 10 A.M. Thursday. As of Sunday, Sabbagh did not know when Jaradat had been moved to Megiddo Prison, where he died. Palestinian organizations representing prisoners say one possibility is that he was placed in a cell with informants at Megiddo. Unlike Shin Bet interrogations, which are documented in memos, the existence of informants is not officially acknowledged by the authorities. Informants use various means to extract information, whether true or false. They boast about their exploits as members of Palestinian organizations, they suggest that the detainee is a collaborator because he does not discuss his actions with them, and they threaten him. 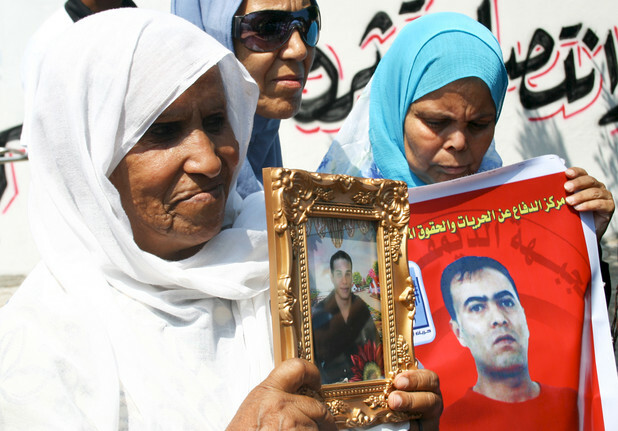 The investigation of Jaradat’s death must go through all phases of his detention and interrogation – and those of thousands of others. But any interrogation will be flawed from the outset because, by authorization of the High Court of Justice, Shin Bet interrogations are not filmed. Only two weeks ago, on February 6, justices Asher Grunis, Hanan Melcer and Noam Sohlberg turned down a petition by four human rights groups demanding the annulment of a 2003 law letting the police forgo the filming or audiotaping of security suspects' interrogations. The organizations also asked the court to require the Shin Bet to visually document the questioning of suspects. The justices said that because the law was now under scrutiny, "the time has not yet come to examine the petitioners’ arguments themselves." The Palestinians do not need an Israeli investigation. For them, Jaradat’s death is much bigger than the tragedy he and his family have suffered. From their experience, Jaradat’s death isn't proof that others haven't died, it's proof that the Israeli system routinely uses torture. From their experience, the goal of torture is not only to convict someone, but mainly to deter and subjugate an entire people. It’s always enjoyable to read good news about the Boycott! For years, the French transnational Veolia has tried to downplay the effect of the boycott, divestment and sanctions (BDS) campaigns which aim to hold the company to account for its role in the Israeli occupation. But now a top Norwegian financial advisor has boldly acknowledged the impact of the BDS movement. Activists in many countries have pressurized local authorities, public institutions, socially responsible investors, and pension funds to do no business with Veolia as long as it is complicit in Israel’s violations of international law. Sjo spoke at a 8 February seminar, organized by Norsif, a Norwegian association which promotes responsible and sustainable investment practices in the Norwegian financial industry. Sjo underpinned her argument by mentioning Veolia’s alleged loss of a €3.5 billion ($4.6 billion) Swedish metro contracts in January 2009. It is remarkable that the observation was made by a financial expert who operates in the higher circles of the investment world. Sjo is a senior adviser to the principle manager of the largest pension fund in the the UK, Hermes Investment Management. She is also director of several publicly listed Norwegian companies. Sjo’s warning is a clear sign to companies that profiting from Israel’s occupation carries serious reputational and financial risks. Financial watchdog BankTrack arrived at a similar conclusion in 2010 when it classified investments in Veolia as “dodgy” because the company provides public transport to the Israeli settlement in the occupied Palestinian West Bank. BankTrack is a global network which monitors the effect of operations of commercial banks, investors, insurance companies, pension funds on people and the planet. Veolia’s role in violations of Palestinian rights was also addressed in a report [PDF] by the recent UN fact finding mission on Israeli settlements in the West Bank, including East Jerusalem. The mission clearly stated that private firms have enabled, facilitated and profited from the construction and growth of the settlements. The report lists “the provision of transport and other services to support the maintenance of settlements” as a business activity that raises particular concerns about abuses of human rights. UN Special Rapporteur Richard Falk was more explicit in his report to the UN General Assembly. He described Veolia’s role in the Jerusalem light rail project which is designed to connect West Jerusalem with Israel’s illegal settlements. Falk recommends that civil society “vigorously pursue initiatives to boycott, divest and sanction” the companies such as Veolia, until they bring their policies and practices into line with international laws and standards. 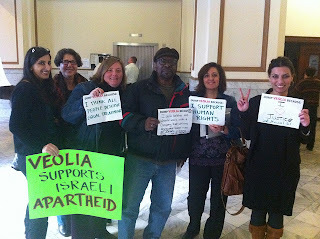 The BDS movement should continue to hold Veolia to account by increasing the pressure on pension funds, socially responsible investors and other financial institutions to exclude or divest from the company. For all the guff you hear about ‘Islamic fundamentalism’ which idiots like the English Defence League and other bigots take to heart, western imperialism is quite happy with the most vicious and undemocratic state in the Middle East. That isn’t surprising since the Arab-American Oil Company (Standard Oil) virtually created the country, plucking a chieftain out of the desert and making him King Saud. Today the ruling royal family numbers over two thousand and the vast wealth from oil is either used to buy American and British weaponry, which rusts in the desert, or it pays for the gambling chips, the prostitutes and the fine wines that our devout Saudi princes enjoy when in London or the West. The official position of this corrupt gang of thieves – who cut off someone’s hand for stealing a loaf of bread but think nothing of enriching themselves with the oil that belongs to the Arab people – is that there are no US bases in Saudi Arabia. Another of many lies this self-serving elite peddles. So the following article in Israel’s Ha'aretz is well worth reading. Exposure of base – believed to be used for strikes against Al-Qaida targets in Yemen and perhaps Iran – comes after news organizations, including the New York Times, held off on publication due to Obama administration requests on the basis of national security. 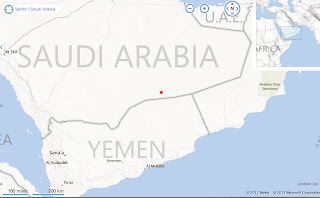 The American media has been in an uproar over the past week over reports on the existence of a secret American drone base built in Saudi Arabia for launching unmanned aerial reconnaissance and strike missions against Al-Qaida targets in Yemen and perhaps other countries such as Iran. Among other details, it has emerged that a number of news organizations, including the New York Times, were aware of the base's location months ago but held off on publication due to a request by the administration that claimed that publication could harm national security. Since the news came out, reporters and bloggers have been feverishly searching satellite footage documenting the base's existence but it hasn't been easy. 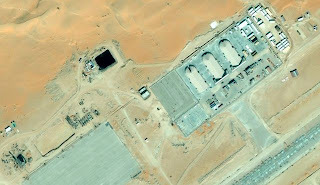 It is very hard to discern any details in the vast deserts of Saudi Arabia which appear at a very low resolution on websites such as Google Earth, especially if you don't know where to look. On Friday, Noah Shachtman, editor of Wired Magazine's blog: Danger Room, managed to locate pictures of what is almost certainly the secret base. Shachtman hinted that sources had pointed him in the right direction and photographs of the base indeed appeared in sharp focus on Bing Maps. There are no aircraft to be seen in the pictures but the base contains three clamshell-shaped hangars, large enough to contain Predator or Reaper drones, the types most typically used by the United States Air Force and Central Intelligence Agency when conducting secret activity in the region, as well as, two relatively short runways. The base in an extremely isolated area, many kilometers from any road or settlement, in a vast desolate expanse in southeast Saudi Arabia known as Rub al-Khali, the empty quarter, not far from the border with Yemen. The base has only a few other buildings probably used by a small support staff, since the teams that pilot the drones are stationed at the Creech Air Force Base in Nevada, from which they control the aircraft via satellite link. The base most likely receives its supplies by air by light aircraft or helicopter. A third and longer runway seems from the photographs to be under construction and could be used in the future by larger unmanned aircraft such as the RQ-170. The base apparently supports missions over Yemen but the range of the drones would enable them to fly over other nations including crossing the Persian Gulf to Iran. So far the drones have operated from existing bases in Saudi Arabia, Yemen, Pakistan, and Afghanistan, from which also manned aircraft take off. This is the first base which is known to have been constructed solely for unmanned aircraft. (The Israeli Air Force, which makes extensive use of drones, deploys these aircraft from bases originally built for manned airplanes). The existence of the Saudi base is a sign of growing closeness in the strategic ties between the U.S. and Saudi Arabia and the huge importance the Obama administration attaches to drone warfare. Obama's drone policy received additional attention this week with the leaking of a memo that set out the criteria upon which the president can order targeted killings using drones, even when the targets are American citizens. 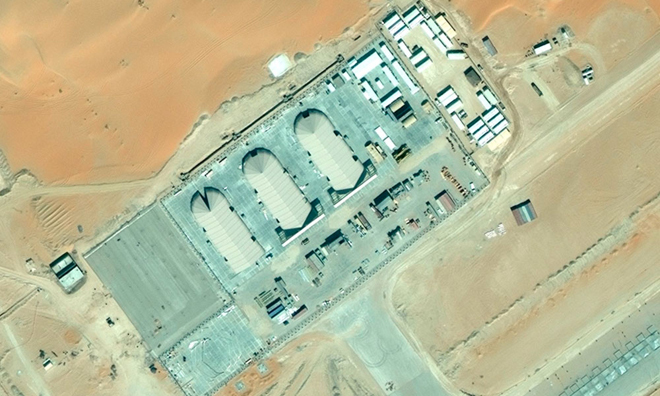 Is This the Secret U.S. Drone Base in Saudi Arabia? These satellite images show a remote airstrip deep in the desert of Saudi Arabia. 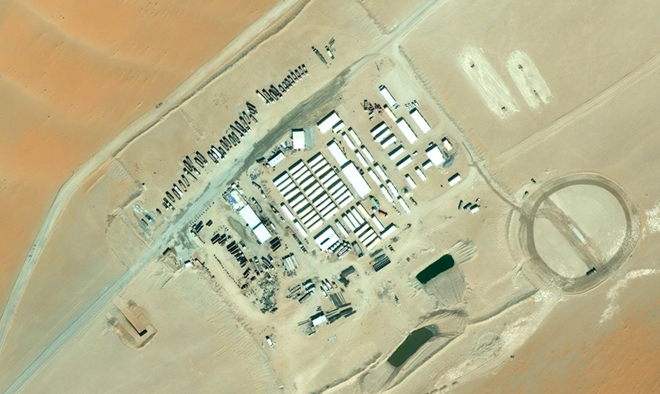 It may or may not be the secret U.S. drone base revealed by reporters earlier this week. But the base’s hangars bear a remarkable resemblance to similar structures found on other American drone outposts. And its remote location — dozens of miles from the nearest highway, and farther still to the nearest town – suggests that this may be more than the average civilian airstrip. According to accounts from the Washington Post and The New York Times, the U.S. built its secret Saudi base approximately two years ago. Its first lethal mission was in September of 2011: a strike on Anwar al-Awlaki, the American-born propagandist for al-Qaida’s affiliate in Yemen, which borders Saudi Arabia. Since then, the U.S. has launched dozens of drone attacks on Yemeni targets. News organizations eventually found out about the base. But they agreed to keep it out of their pages — part of an informal arrangement with the Obama administration, which claimed that the disclosure of the base’s location, even in a general way, might jeopardize national security. On Tuesday, that loose embargo was broken. The image of the airfield, available in Bing Maps, would be almost impossible to discover randomly. At moderate resolutions, satellite images of the area show nothing but sand dunes. Only on close inspection does the base reveal itself. 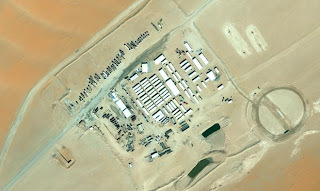 In Google’s catalog of satellite pictures, the base doesn’t appear at all. The images show a trio of “clamshell”-style hangars, surrounded by fencing. Each is more than 150 feet long and approximately 75 feet wide; that’s sufficient to hold U.S. Predator and Reaper drones. The hangars are slightly larger, though similar in shape, to ones housing unmanned planes at Kandahar Air Field in Afghanistan. 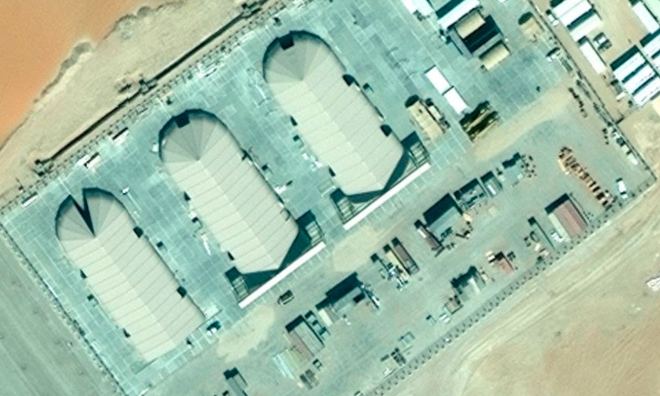 Shamsi Air Field in Pakistan, which once held U.S. drones, boasts a group of three hangars not unlike the ones of the Saudi base. No remotely piloted aircraft are visible in the images. But a pair of former American intelligence officers tell Danger Room that they are reasonably sure that this is the base revealed by the media earlier this week. Three airstrips are visible in the pictures; two are big enough to land drones or conventional light aircraft. A third runway, under construction, is substantially longer and wider. In other words: The facility is growing, and it is expanding to fly much larger planes. The growth has been rapid. When the commercial imaging company Digital Globe flew one of its satellites over the region on Nov. 17, 2010, there was no base present. By the time the satellite made a pass on March 22, 2012, the airfield was there. 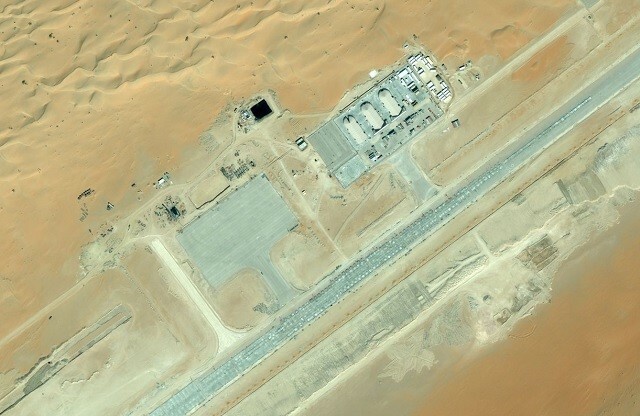 This construction roughly matches the timeline for the Saudi base mentioned in the Post and in the Times. 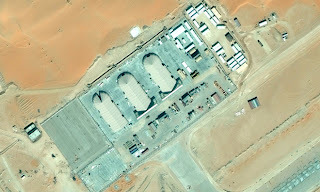 If this picture does prove to be of a secret U.S. drone base, it wouldn’t be the first clandestine American airfield revealed by public satellite imagery. In 2009, for instance, Sen. Diane Feinstein accidentally revealed that the U.S. was flying its robotic aircraft from Pakistani soil. The News of Pakistan quickly dug through Google Earth’s archives to find Predator drones sitting on a runway not far from the Jacobabad Air Base in Pakistan – one of five airfields in the country used for unmanned attacks. The pictures proved that the Pakistani officials were actively participating in the American drone campaign, despite their public condemnation of the strikes. Until then, such participation had only been suspected. While the drone attacks continued, the U.S. was forced to withdraw from some of the bases. So far, reaction to the Saudi base has been relatively muted. American forces officially withdrew from Saudi Arabia years ago, in part because the presence of foreign troops in the Muslim holy land so inflamed militants. It’s unclear how the drone base changes this calculation, if at all. The drone base’s exposure is part of a series of revelations about the American target killing campaign that have accompanied John Brennan’s nomination to be the director of the CIA. Brennan currently oversees targeted killing operations from his perch as White House counterterrorism adviser, and would be responsible for executing many of the remotely piloted missions as CIA chief. In addition to the drone base disclosure, an unclassified Justice Department white paper summing up the Obama administration’s criteria for eliminating U.S. citizens was leaked this week to NBC News; the document argues that a judgment from an “informed, high-level” official can mark an American or robotic death – even without “clear evidence that a specific attack on U.S. persons and interests will take place in the immediate future.” (.pdf) The White House has since promised to give select Congressmen the classified and detailed legal rationales behind the white paper. But Sen. Ron Wyden told Brennan at his Senate confirmation hearing that the Justice Department is not yet complying with President Obama’s promise to disclose those legal memoranda. Feinstein said she was seeking eight such memos in total. In their hours of questioning Brennan, however, the Senators didn’t once ask the CIA nominee about the secret Saudi drone base. Perhaps that’s because they didn’t have a visual aid. If you want to a glimpse of the warped and twisted mentality of the Jewish Defence League, whom the organiser of the far-right Zionist/Christian fundamentalist demonstrators, Simon Cobbs, thinks are a fine bunch of people, then take a look at a tweet which appeared today from what is apparently the more 'moderate' of the two JDL twitter accounts. Dubai shopping mall that the Zionists have relocated to Gaza! It was a bitterly cold day today and well done to all those who braved the elements. The Zionists seemed particularly bedraggled and most of them appeared to be non-Jewish Christian fundamentalists. It included poor Jill Young, the mad Fundie in blue, who insists on carrying a poster of me which she has hideously distorted. It must be a sign of love, since these Christians are taught to love thine enemy. Despite being an unassuming person, when she was expressing too much concern over my son's presence (he is autistic) I was forced to tell her that she looked like the female equivalent of Jimmy Saville. She seemed quite pleased at the comparison. I post a number of video clips of today's picket. They show primarily the pro-Zionist supporters on the opposite side of the road. No one wants to know them and in one video a man crosses to our side of the road to collect a leaflet! The Zionist demonstration increasingly seems to consist of either Christian Zionists who want all the world’s Jews to ‘return’ to Palestine, in order that they can be consumed in the fires of Armageddon, thus enabling Jesus to return and the faithful to Rapture to heaven, or supporters of the Jewish Nazi Kach movement like poor Simon Cobbs, who is seen wearing some form of animal around his head. "The shop makes no money — it’s empty," said local resident Simon Cobbs. "The only people are Brighton Jews, going in to support the shop and keep it going." Today we learnt that a shop we hadn’t picketted, Staples, has decided not to stock Sodastream products anymore. Why? Because no one wants to buy them. Whoever in Sodastream made the decision to open a shop in Brighton, a loss leader if ever there was one judging by the pictures of an empty shop, should be awarded the golden order of the boot. True it has indeed gained Sodastream publicity – but it has all been one-way - downhill. 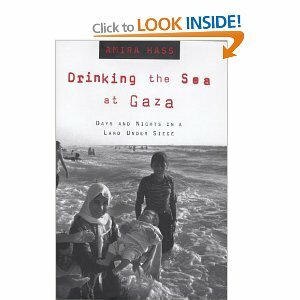 Anyone who buys a Sodastream refill or product now knows that they are supporting ethnic cleansing. There was one man who went buy shouting that he’d be happy to buy from Sodastream. I got no reply when I asked if he’d have bought German goods in the 1930’s in defiance of the anti-Nazi boycott. In fact he probably would have done, because when most Jews were boycotting German goods, the Zionists were setting up their own trade agreement, Ha'avara, with the Nazi Government. It must be a dilemma for the Christian Fundamentalists - standing by the rainbow flag of the 'sinful' satanic gays - still you can't choose your bedfellows!! We can also see Cobbs repeatedly shouting ‘Tony’ to me. Although it is heart-warming that he misses my companionship and erudite wit, it hardly squares with the complaint of anti-Semitic abuse, homophobia, spitting and all the other lies that these far-right merchants have been coming out with. 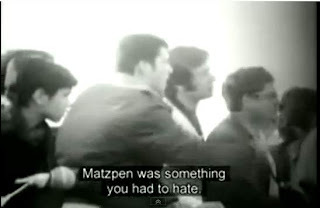 I have also taken care to video our own demonstration to show that contrary to the lies in the propaganda sheet that calls itself the Jewish Chronicle, there is no ‘mob rule by the Sea’ or ‘Brighton rocked by hate slogans’ – unless the call to boycott an apartheid state is a form of hate. #hove today Don't believe the lies!" Not unnaturally Cobbs retweeted it to his few remaining friends in the JDL. There’s just one thing wrong though with the point they are making - that Gaza is an affluent place of plenty. 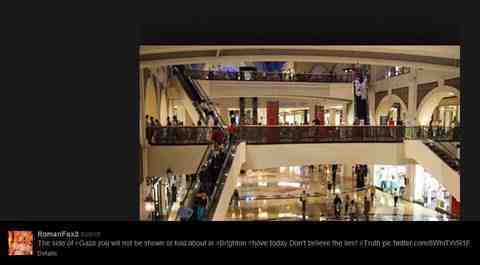 It is The Mall of Emirates in Dubai. True all Arabs are the same to Cobbs and mates but even they should know there is a slight difference between impoverished Gaza, where the water is unfit to drink, and Dubai! I should also add that the usual policeman who attends these pickets/demonstrations – despite the cold and lack of anything to do – seemed positively interested and engaged throughout!! You’ve probably heard the racist outpourings of Israel’s defenders. In turning themselves into the oppressed, the Palestinians become the new Nazis. Prime amongst these are the ‘anti-Semitic’ Hamas that the Israeli state and shin bet helped set up. Three of the women, the sisters, are still halachically Jewish, i.e. they are the children of a Jewish mother and haven't become an apostate - converted to another religion. The fourth woman has converted to Islam and wouldn't be considered Jewish, but the Israeli Law of Return would still recognise her nationality as Jewish. So what is their crime? It is to have lived with and in some cases married Palestinians, the mortal enemy, Amalek. If they had been white, neo-Nazi Russians, with Jewish ancestry, then they could have come to Israel with no problem. What was that about Zionism not being a form of racism? One converted to Islam and married Palestinian, three sisters moved to Gaza with Palestinian father after Israeli mother died. Umm Bilal has not been able to visit her imprisoned son for eight years. Four Israeli citizens are being denied the right to visit Israel, see their families and update their documents at the Interior Ministry - just because they happen to live in the Gaza Strip, according to their lawyer. This would never happen if, for instance, the women lived in the United States, charged Nomi Heger of Gisha - Legal Center for Freedom of Movement, who is representing them. In that case, a way would be found to enable the visit even if they lacked the necessary Israeli documents, she said. Gisha's efforts to solve the problem with the Interior Ministry, the Coordinator of Government Activities in the Territories and the army's Coordination and Communication Office for Gaza all came to nothing, even though these agencies do not deny that the women are citizens. It therefore took their cases to court. The first petitioner, who filed suit in the Be'er Sheva District Court, is a Mrs. Wahidi. She was born in Rehovot in 1965, converted to Islam with her mother in the 1980s, married a resident of Gaza and has lived with him there for years. After her eldest son was born, the Israeli Civil Administration ordered her to turn in her Israeli identity card and replace it with Gaza residency papers, so that she could register the boy's birth and obtain health care services. At that time, Israel still controlled the Strip directly. Her mother, 77, still lives in Israel, and Wahidi hasn't visited her since 1999. Only in 2011 did Wahidi learn that as an Israeli citizen, she is entitled to enter the country. Since then, she has been trying unsuccessfully to obtain the necessary permit from the Coordination and Communication Office. The other three petitioners, who filed suit in the Jerusalem District Court, are three sisters born in Nahariya between 1979 and 1984 to an Israeli mother and a Palestinian father. Their mother died when they were young, after which they moved with their father to Gaza. But they have two sisters who live in Israel. Until 2005, the Dabas sisters visited Israel regularly. After the 2005 disengagement from Gaza, however, entry restrictions were tightened, and they were unable to visit for the next six years. 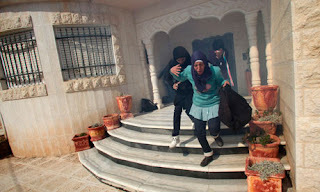 In 2011, they obtained a one-time entry permit (as Gaza residents ) to attend their sister's wedding, unaware that as citizens, they had a right to enter. Since August 2012, they have been unsuccessfully trying to get another entry permit. In an emailed letter to Gisha, attorney Irit Weisblum of the Interior Ministry wrote that the sisters "are Israeli citizens, but don't have Israeli documentation that would enable their unambiguous identification when they arrive at the border to enter Israel." In other words, because they are citizens, they can't get entry permits as Gaza residents, but because they are Gaza residents, the authorities won't make it possible for them to enter as citizens. When Wahidi applied for her permit, she was told that she had to first come to the Erez checkpoint between Israel and Gaza for an interrogation by the Shin Bet security service. She refused. Gisha claims this condition is illegal. Later, she was told by the Coordination and Communication Office that she would be allowed to enter on her Israeli identity card - which she no longer has. In other words, the system knows she is Israeli, but is ignoring the fact that her ID card was deposited with the Civil Administration (the former name of the Coordination and Communication Office ) about 10 years ago. The Be'er Sheva court will hear Wahidi's case in late February, while the Jerusalem court will hear the Dabas sisters' case in early March. It takes a lot for the head of the IOF's Central Command, Gen. Nitzan Alon, to tell his commanders not to fire on sight at civilians. In four separate incidents over a 2 week period, young unarmed Palestinians were killed. In the West Bank there has been no armed resistance to the Israeli occupation, thanks to the quisling regime which operates, as a subcontractor in Ramallah, under Abbas and his American trained henchmen. But even if Israel lacks any 'terrorism' threat to justify its use of force it can always rely on the BBC and the 'free press' to only report attacks on Israel. If 4 Jewish children had been killed in the West Bank in two weeks, the BBC would have moved special reporters into the West Bank. They would have analysed the situation and no doubt come up with the usual punditry. But dead Palestinians are not news. That is how the racist framework of the BBC and mass media operates. Maj. Gen. Nitzan Alon's instruction follows four incidents in the West Bank in the past two weeks in which soldiers opened fire and killed unarmed Palestinians. The head of the Israel Defense Force's Central Command, Maj. Gen. Nitzan Alon, has instructed commanders of units stationed in the West Bank to act with restraint and moderation when dealing with the civilian population. In a letter sent to the commanders earlier this week, Alon told them to instruct their soldiers to strictly adhere to the IDF's rules of engagement. 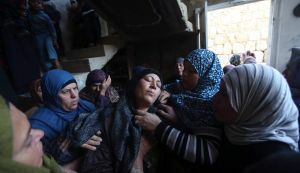 The instruction followed four incidents in the West Bank in the past two weeks in which soldiers opened fire and killed unarmed Palestinians. The IDF's operational investigations of the incidents are being completed and the results will soon be presented to Alon. Meanwhile, four separate Military Police investigations have been opened into the incidents. In three of the cases - a youth killed in the village of Budrus near Ramallah, a young woman shot in Al Aroub near Bethlehem and a young man shot next to the separation fence south of Hebron - serious violations of the IDF's standing orders on when to open fire have been found. 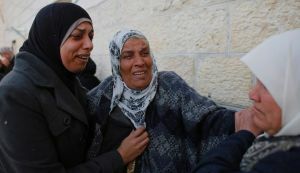 In the fourth case, in which an officer opened fire and killed a Palestinian youth during a demonstration in Bethlehem, the investigation found mistakes but no violation of regulations. As a result of the incident near Hebron, a company commander from the Home Front Command was suspended. He commanded the forces that unnecessarily opened fire on the Palestinian, who was attempting to cross the fence through an opening in order to work in Israel. Alon wrote that taking human life without justification damages the legitimacy of the IDF's actions in the territories, in the eyes of both Israeli society and the international community. The Central Command must carry out its responsibilities using force wisely and proportionally, Alon wrote: Because the forces operate in a dense civilian environment, they must use force in a restrained fashion, and that applies especially to live fire. Alon warned that the death of uninvolved civilians could encourage violent demonstrations by the Palestinians. The units stationed in the West Bank need to improve their knowledge of the IDF's rules of engagement, upgrade their marksmanship training and the individual training of soldiers by their commanders, and improve the commanders' control of events in the field, Alon wrote. While the Central Command is prepared for the possibility of an escalation in the territories, all forces must now implement a policy of restraint in cases of friction with unarmed civilians, Alon wrote. Pastor Marc Donadille with his wife and children. Donadille worked with CIMADE, a Protestant movement to save the Jews of southern France by smuggling them to Le Chambon-sur-Lignon. France, between 1939 and 1943. The deportation of foreign born Jewish men in occupied Paris was carried on May 14 1941. Summons were sent to Czech, Austrian, and Polish Jews. They were instructed by the French prefecture of police to come to specific locations in the capital in order to have their papers examined. 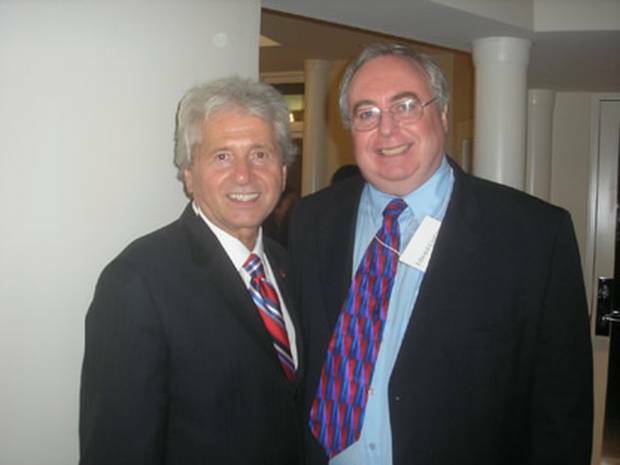 Approximately 5000 foreign born Jewish men between the ages of 18 and 40 reported to the various assembly points. Once arrived, they were forbidden to leave. The detainees were put on buses and driven to the Gare d'Austerlitz train station and immediately boarded onto four special trains bound for the internment camps of Beaune-la-Rolande and Pithiviers in the Loiret near Orleans. The Marseille branch of CIMADE, a French Protestant group established in 1939, declined to attend the region’s main memorial ceremony for Jewish Holocaust victims because of the pro-Israel attitude of CRIF, the umbrella group representing French Jewish communities, which organized the event together with the municipality. The values that led CIMADE to save Jews make the group "equally committed to oppose the colonial, discriminatory and bellicose policy of Israel with regards to the Palestinians," CIMADE regional deputies Françoise Rocheteau and Jean-Pierre Cavalie wrote in a letter to the local CRIF branch on Dec. 21. It also said CIMADE was determined to fight "apartheid." The letter, which was published online on Feb. 11 by a group which promotes a boycott of Israel, was a reply to an invitation extended by CRIF to CIMADE to attend the 70th commemoration on Jan. 20 of the deportation and subsequent murder of thousands of local Jews. Marseille had a Jewish population of 39,000 in 1939, according to Beit Hatfutsot, the Museum of the Jewish People. Only 10,000 remained after the Holocaust. 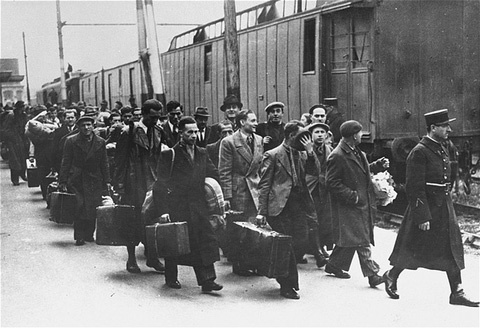 CIMADE organized "vital relief and later resistance" in connection with the murders, according to Yad Vashem, and helped smuggle Jews to safety. Yad Vashem named Madeleine Barot, who headed CIMADE during the Holocaust, a Righteous among the Nations in 1988. She passed away seven years later. "We understand our positions may appear unacceptable, making us unwelcome at your commemoration," the CIMADE representatives wrote. "We cannot keep silent on our convictions but do not wish to cause a scandal." 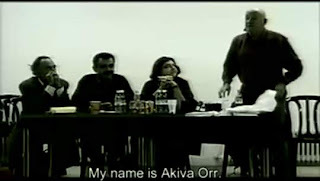 I only met Akiva Orr once, when he spoke at Sussex University in the 1980’s, to a sparsely attended meeting of the Palestine society on campus. 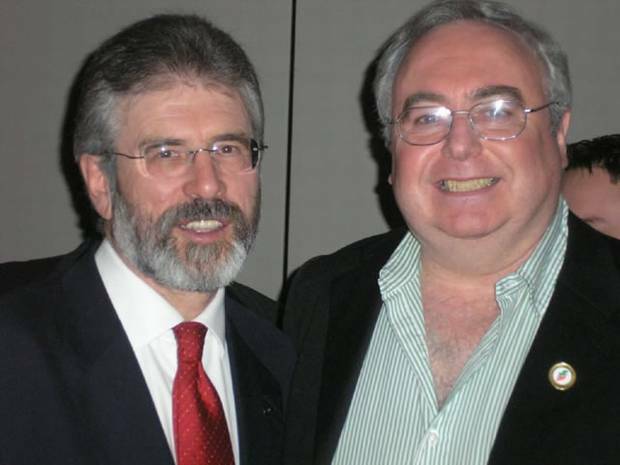 His book on Israel – appropriately titled ‘The UnJewish State’ had just been published. Akiva was an entertaining if not eccentric speaker who from distant memory, seized on various points to wander off on a tangent rather than develop a consistent theme. He was one 3 members of Matzpen who wrote an article, later to be republished by the International Socialists Group, on the Class Nature of Israeli Society. As someone aged 16, who could already see, without having read anything, that the universalism of socialism and the particularism of Zionism could not be reconciled, the article hit me like a bombshell. Everything began to make sense to me. Either it was unity of the working class internationally or unity of the Jews – rich and poor alike. Schnews! 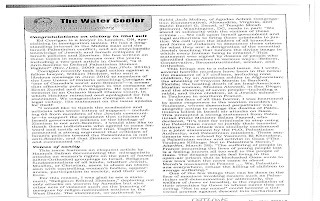 The Brighton anarchist newssheet has an interesting review which describes him as the ‘godfather of Israeli anarchism’ Akiva Orr’s life spanned the whole of the Israeli state A child refugee from Nazi Germany, he came to see many of the things he escaped from being re-enacted in a different form, including a Law of Return which uses the same definition of ‘Who is a Jew’, as the Nuremburg Laws of 1935. 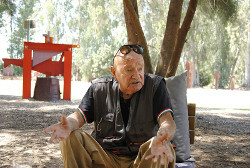 Aki’s was a golden life of struggle, starting with his role as a militant in the Israeli seaman’s strike of 1950, which the state brutally attacked, calling the strikes terrorists on a part with the fedayeen (Palestinian guerilla fighters). Akiva Orr, an activist and writer, who helped form the Israeli anti-Zionist party ‘Matzpen,’ passed away this week. His ideas, which can be viewed in the documentary on the history of Matzpen (below), challenged Israeli society and influenced generations of activists. Akiva Orr, co-founder of the Israeli anti-Zionist political party, ‘Matzpen,’ and one of the most well-known-figures in the radical left, passed away this weekend. Matzpen was a radical and controversial political party that opposed Zionism and called for an alliance between Israelis and Palestinians. The group was also very active on socioeconomic issues, and was the first left-wing party to join the Mizrahi “Black Panthers” protests in the early seventies. Orr was born in Berlin in 1931. His parents left to Palestine when he was three years old after the Nazis rise to power. Orr grew up in Tel Aviv, and was drafted into the Haganah and later on the Israeli Navy during the 1948 war. 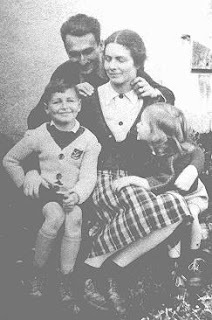 He served in the navy until 1950, and then joined the merchant navy, where he participated in the Israeli Seamen’s Strike of 1951, an event which left Orr highly politicized as a result of being beaten by the Israeli Police. 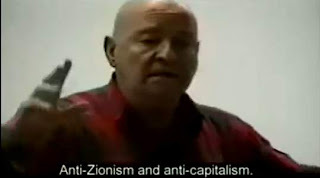 In the same year he joined the Israeli Communist Party (ICP). 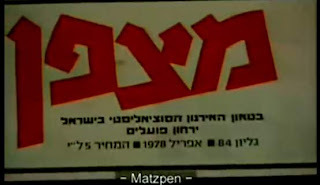 Orr, along with three other party members, broke off from the ICP and formed Matzpen in 1962. The organization committed itself to a socialist revolution, opposed Zionism and called for recognition of the Palestinian people’s national rights. 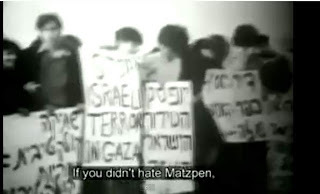 Matzpen remained on the margins of Israeli politics throughout its existence, never gaining more than a few dozen members. 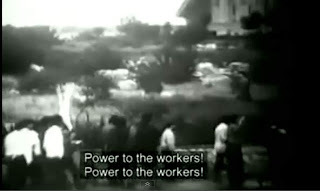 The group began to receive attention in the Israeli press after openly opposing the 1967 war and the Israeli occupation. 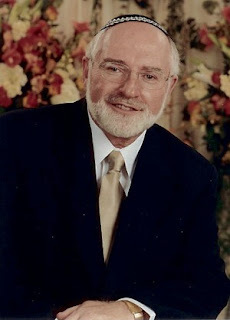 Orr moved to London in the 1960s, where he remained until his return to Israel in 1990. He was invited to speak at the 2011 Israeli tent protests on Rothschild Boulevard, Tel Aviv, where he delivered lectures on the Seamen’s Strike of 1951 and on direct democracy. Several years ago, in response to a +972 Magazine article criticizing widespread social justice protests, Orr sent Joseph Dana his rather surprising take on the Israeli protest movement. Dana posted this analysis, along with a video interview with Orr. I have to confess that although my socialist principles oppose use of the libel laws, there are times when it is the only way that those who have been traduced and libelled, without any recourse to media of their own, can gain recompense. 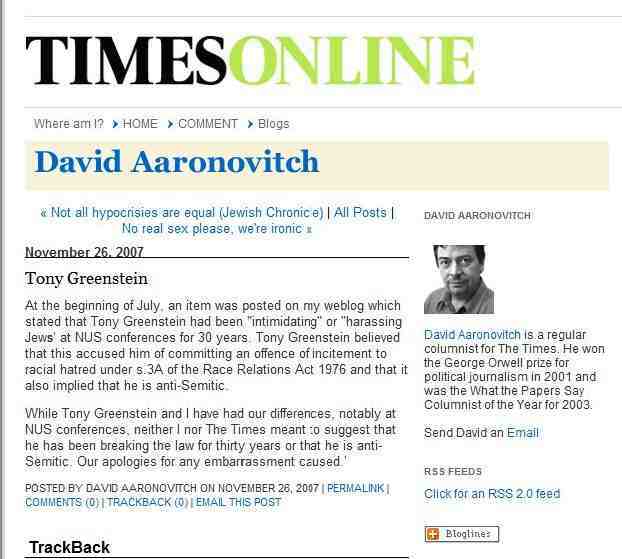 About 5 years ago, David Aaronovitch - the Stalinist/New Labour warmonger - who writes a column for The Times allowed a comment on his blog from a certified Zionist nutcase ('Mad' Mikey Ezra) which accused me of having spent my time harassing Jewish students. What he meant is that I had spoken at meetings at which they were unable to muster an opposing argument, were therefore upset poor darlings and naturally felt they were being harassed, by having to listen to something they disagreed with! 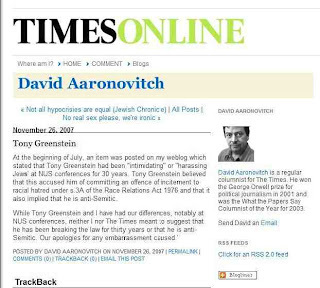 I therefore issued a writ for libel against The Times, who promptly sought an Opinion from the leading libel lawyer, Richard Rampton QC. Unfortunately the advice was not favourable. Mikey said how he had suffered psychological damage as a result of having to listen to the truth, but the lawyers didn't think that would pass muster. So for the first time in his life, Rupert Murdoch contributed £1,000 towards a Palestinian charity, Friends of Bir Zeit University! 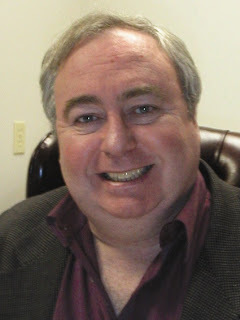 Ed Corrigan is a human rights lawyer in Canada. He is Jewish and anti-Zionist. Like all of us, he has been accused of ‘anti-Semitism’ by Zionist toe rags and accused of being a ‘traitor’ ‘treason’ etc. As I never stop reminding people, anti-German anti-fascists were also called traitors by the Nazis, so it should be considered high praise indeed to be considered a traitor to the racist political philosophy of Zionism. When Ed was recently libelled by a Zionist lawyer, William Hechter, he sought legal redress and sure enough Hechter backed down. Although I don’t like the libel laws, as they inhibit free speech, these defamers only understand one language. I was pleased to submit a message of support to Ed before the outcome was known and I also agreed to testify if necessary. Congratulations Ed! Zionism is racist? Perish the thought. This is another example of ‘anti-Semitism’ say the propagandists. You’ve probably heard the racist outpourings of Israel’s defenders who compare Palestinians to sub-humans. But in the eyes of the Zionists, the oppressed, the Palestinians become the new Nazis. Prime amongst these are the ‘anti-Semitic’ Hamas that the Israeli state and shin bet helped set up. Parallels Between the SWP and the WRP?